Food lovers of New Canaan rejoice! Carpe Diem, a Northern Italian inspired restaurant by Alan Basaran, has opened and the housemade pastas are delicious. As CTBites presented earlier, Basaran, a North Stamford resident and owner of Carpe Diem Restaurant in New York City, is excited about creating delicious Northern Italian cuisine in New Canaan, his wife’s hometown. After studying finance, Basaran followed his lifelong passion and entered the culinary world, advancing through the kitchen hierarchy of line chef, sous chef and ultimately head chef. His love of interacting with customers brought him to the front of the restaurant and this rare combination in all aspects of the restaurant over the last twenty years is evident at Carpe Diem. Carpe Diem’s newly redecorated space on Locust Avenue is divided into three dining areas. The most informal space is to the left of the entrance and includes a five seat bar plus several tall tables. For those looking for after dinner drinks, ample standing room is available; and on weekends the atmosphere is vibrant. The main dining area to the right offers a white-table clothed dining experience for up to forty-five in a very relaxed and pleasant atmosphere. The last area in the center of the restaurant contains a semi-private area for up to twenty customers. The rooms are separated by floor to ceiling two-sided built-in wine racks. The walls are decorated with numerous photos of wild horses as Alan and his wife are both horse lovers; these photos add an openness to the rooms. Overall I found the rooms incredibly inviting and relaxing and I am looking forward to warmer weather when the front patio will allow for al fresco dining. To oversee the kitchen, Basaran tapped Chef Victor Pastuizasa, the chef from his New York’s location for the last fourteen years. The long-standing relationship between the two culinary professionals allowed this duo to immediately present delicious food at the newly opened New Canaan location. The menu includes a wide selection of appetizers including soups, salads, cheeses, cured meats, plus a few delicious seafood and chicken options. 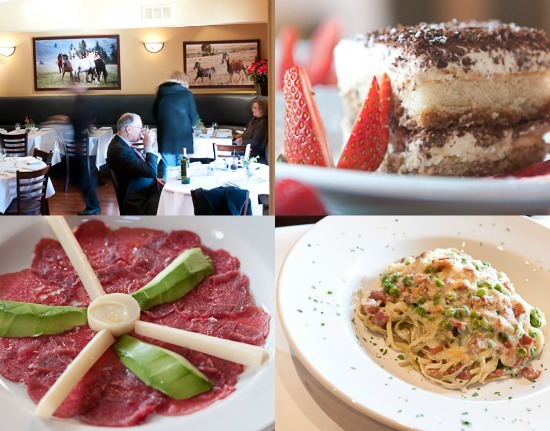 Entrées include a wide variety of pastas, meats, seafood and chicken. Basaran is currently sourcing from local purveyors and is in the process of developing and expanding his relationships with several others. The menu will vary slightly as seasonal ingredients become available and Chef Pastuizasa is excited about his flexibility to offer these in the daily specials. of palm and a few drops of truffle oil. The rich flavors of the beef are supplemented by the earthiness of the truffle oil. The Ahi tuna tartare with crostini delivers diced tuna presented atop of a guacamole of avocado, jalapeño peppers, capers and onions. The flavors of this appetizer are bright with just a hint of spiciness. For those with a bit of an adventuresome palate, the fried artichoke offers a unique experience with the whole trimmed artichoke quickly fried to present a crispy exterior with the artichoke heart maintaining its wonderful character. 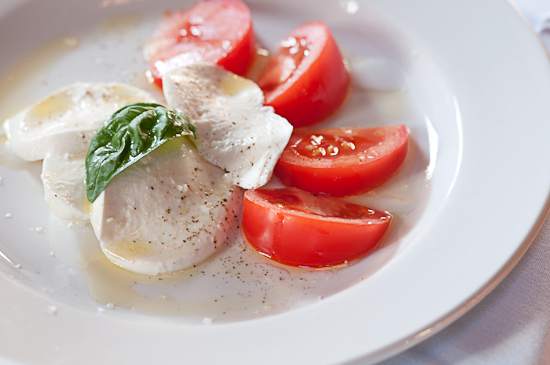 In the coming weeks Carpe Diem will add a house made Burrata to the menu. The long pastas and all of the sauces are made in house. Of particular note are two delicious choices. The first is the Spaghetti with shrimp, scallops, mussels, little neck clams, arugula, and radicchio in an organic tomato sauce. The two jumbo scallops are perfectly prepared, the two extra large shrimp are sweet and delicious and the shellfish add a nice richness to the dish. 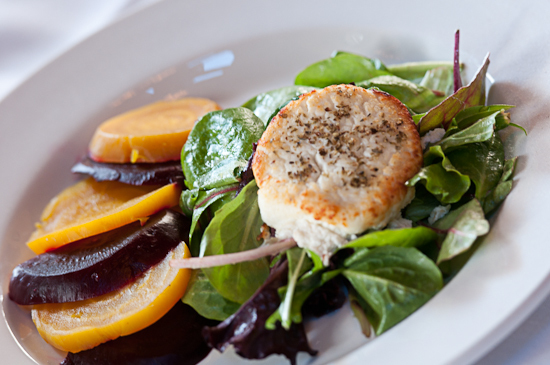 The addition of the arugula and radicchio bring a nice peppery background to the dish. The second is the Penne with sausage and peas in an organic tomato sauce with just a touch of cream. The pasta is perfectly cooked to barely al dente, the house made sausage is delicious and the addition of the sweet peas creates a truly delightful choice. The Pappardelle with a Bolognese sauce is also delightful. The pasta is cooked al dente and offers a perfect texture that is complemented by the mild flavors of the veal and the beef Bolognese. 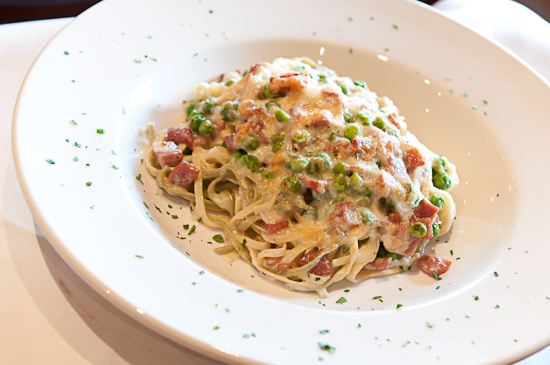 The Spaghetti with green peas and prosciutto in a pecorino cheese sauce is also delicious. The saltiness of the prosciutto and the sweetness of the peas are enhanced by the creamy sauce to create a rich and flavorful dish. My favorite of the entrée choices is the Veal Piccatina, medallions of veal that are quickly pan seared to create a crisp exterior while maintaining a moist and tender interior. The lemon sauce is bright and the acidity of the lemons is complemented by the saltiness of the capers. Accompanying the veal are light and fluffy mashed potatoes, prepared simply with garlic and rosemary. The grilled and sliced Prime Ribeye steak is served over a mound of fresh greens, lightly tossed with the house dressing. The steak was perfectly grilled to medium rare and seasoned simply with salt and pepper. Likewise pan grilled lamb chops are served with a potatoes gratin. For dessert Carpe Diem offers several choices and my favorite is the Tiramisu which is light and creamy with a light touch of Cointreau. The individual apple pie is also delicious. The nutty and lemony dough is full of flavors and is served with a mild vanilla gelato. The Crème Caramel is another excellent choice and delivers a creamy texture complemented with a delicious caramel sauce plus several gelato flavors including chocolate and my favorite, the blackberry Cabernet are also available. After only a few weeks on the New Canaan restaurant landscape, Carpe Diem is presenting many delicious choices in a relaxed and inviting environment.